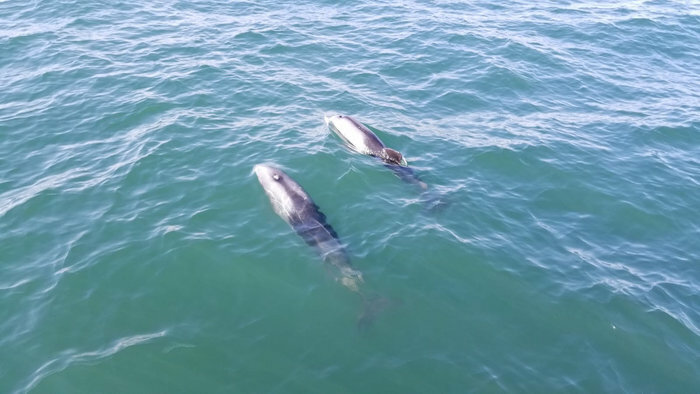 We went on a Dolphin Cruise with Laramon Tours inWalvis Bay. From making the first arrangements via email, their efficiency and information was clear from the start. Arriving at their private pier 08h30 am, at the Lagoon, Walvis Bay Harbour, the view is astonishing and you can see the whole harbour. Maybe enjoying a coffee whilst you wait to go on board at 09h00 am, if you arrived a little bit too early. Or you can stroll around the hand crafted shops. For me, I love nature and enjoyed every little angle of the view in front of me, while we patiently waited to board. The boat departs at 9 am ,where we met named Walter our Skipper who explained where everything was on the board ex. the bathrooms, the safety gear and an short overall version on what we might see today while out on the sea. The entertainment started a few minutes In as the first seal jumped onto the deck. 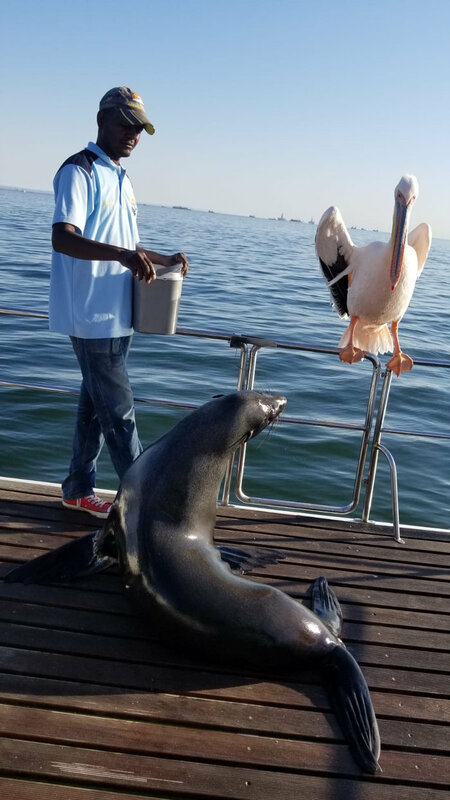 Asking nicely for his treat.On the cruise we were very happy to see some pelicans, sea gulls and a pod of dolphins, playing alongside the boat. 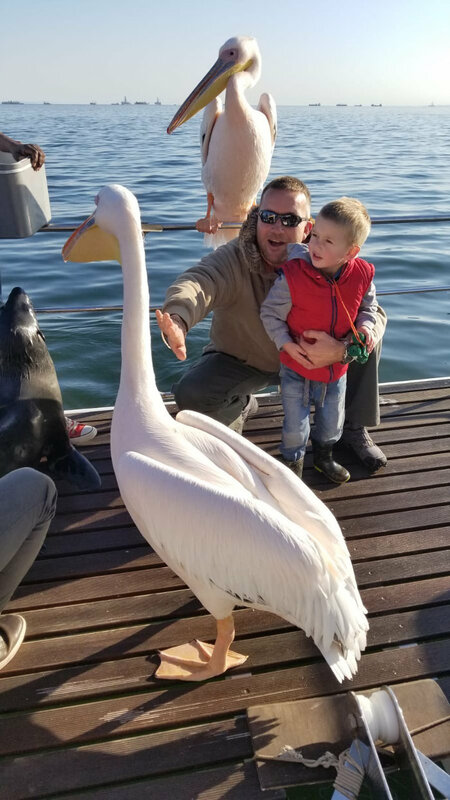 Seeing all these different animals, the kids enjoyed the cruise a lot! We also learned more about the Oysters that is farmed locally and then shipped out overseas. 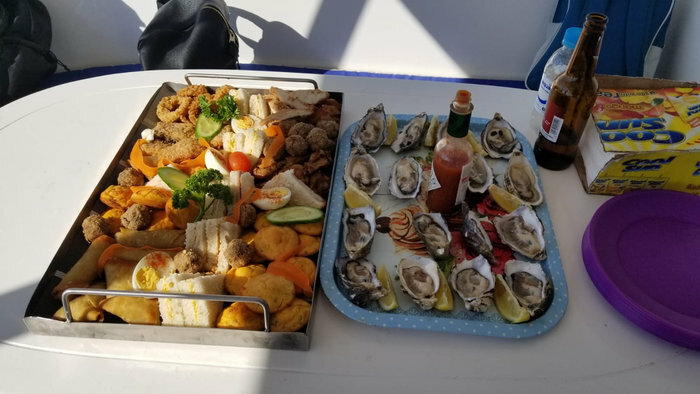 We had the privilege to enjoy these local grown oysters and some snack platters that came with some champagne. They took us around the harbour and showed us some ships, vessels and cranes. The overall trip is about 3.5 hrs long and before you know it, time has passed and the cruise is finished. From our experience, we enjoyed it a lot! Especially my little one. Lots of laughter and excitement. Great company and Walter, the Skipper gave information throughout the cruise, answered questions and was very friendly, helpful and kind. We will definitely refer our clients to Laramon Tours. The maguni (as it is called in the north-east) is without a doubt one of Namibia’s most delicious wild fruits. This bright-orange coloured fruit with its hard, thick skin and juicy, brownish flesh has an extremely complex flavour, suggesting an entire bowl of tropical fruit salad. Sucking the sweet flesh from the pips is a most rewarding eating experience (quite messy). It can be found in northern and north-eastern Namibian regions such as along the Kavango River, the Zambezi Region (formerly the Caprivi Strip) and around Rundu. The corky bark is pale grey to grey-brown and the under bark is a pale brown colour. The leaves are bright green above and a paler green below. Small, green-white flowers display from October to December. A round berry is dark-green with white to pale green specks and turns yellow when mature in a hard, woody shell. The fruit is edible and the fermenting fruit can be made into an alcoholic drink. The seeds are toxic and the bark contains strychnine. The strong wood is used for tool handles. 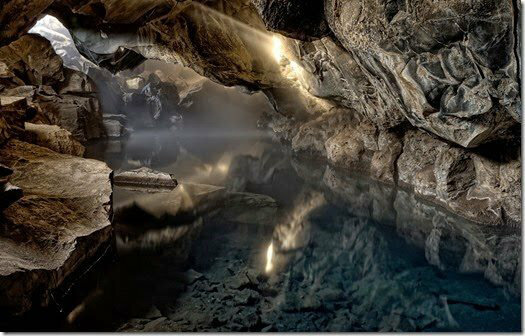 If you have ever wondered where the largest underground lake is, it is found in Namibia at the bottom of a cave called Dragon’s Breath. The discovery was made in 1986 and the cave – because of the humid air that rises from it – has come to be known as Dragon’s Breath Cave. In its belly lies the largest underground non-subglacial lake in the world. So large, in fact, that divers have only been able to chart its depths to 430 feet. 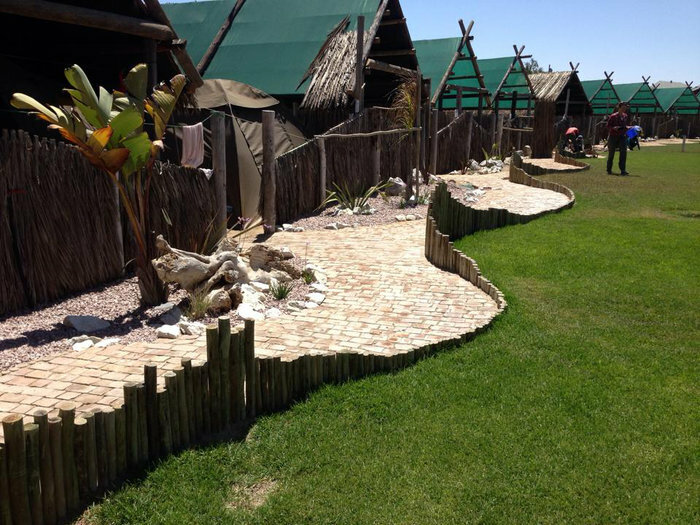 On the edge of the Dorob Park,the Swakopmund River mouth and mere metres from the beach, Tiger Reef has a prime location can’t be beaten. You wake up in the mornings to the sound of waves and bird song. Clean, neat private campsites with covered parking, a sprawling lawn, new ablution block, well kept, serviced hourly, hot and cold running water, right next to the famous Tiger Reef Beach Bar and Grill, enjoy that early morning stroll down the beach or catch the sundowner with a cold beverage in your hand. Access control with a remote gate and security. Stroll along the beach to the the lagoon in the Dorob National Park behold and its bird life – flamingos, pelicans etc. The National Marine Aquarium is meters from our entrance, walking distance to the Jetty and the unforgettable restaurant at it’s point-some 300 odd metres into the Atlantic Ocean- Jetty 1905. Town centre is a scenic few blocks away.